Time means that education is either about communicating content or teaching people to think. If you focus on communicating content, like getting through the CAPS Curriculum each year, you will not be able to adequately deliver on teaching learners to think. If you focus on teaching learners to think, you can feed them as much content as you want and they will be able to interpret, understand and use that content as and when they desire. This is where we are falling short in basic education in South Africa. We are not teaching learners to think. The focus is on getting through the content of the CAPS Curriculum. Innovation in education has to provide educators with the means to adequately focus their energies on information comprehension. This is the value that any innovation in education must add. While some may say we need to focus on the curriculum, others say leave the curriculum as is and focus on the delivery mechanisms i.e., how are learners going to engage with the content? I believe more focus needs to be placed on how we deliver the current CAPS Curriculum content. And identifying how we deliver this content is all about knowing how the current and future learner cohorts communicate and assimilate content. Pushing hardware and “giving” learners access to devices, which they need to leave behind at school each day, is not the answer. Most, if not all learners, already have access to a device. This is where the focus of innovation in education should also lie. How do we make use of existing infrastructure to improve the way we communicate content to a learner? At Kreeate Digital, we’ve built a game that introduces learners to the notion of becoming an entrepreneur. The Kreeate Game requires learners to start businesses in different industries (retail, automotive and technology) and build those businesses up to a point where they can unlock investment opportunities in additional industries such as sport & entertainment and Property. Along the way, they learn about the CIPC and the business registration process and SARS and relevant business taxes. The main aim is to earn as many coins as you can in order to climb the leaderboard. We have curriculum aligned quizzes in the game, where correct answers are rewarded with coins as well. Taking the quizzes means you are essentially revising your work. So, you can earn coins whether you are running your businesses or taking our quizzes. The Game is ‘edutaining’ and can be played offline. 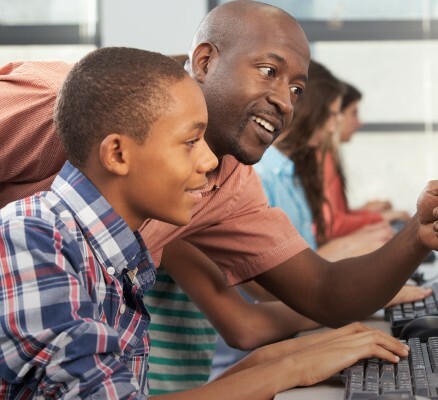 Using existing infrastructure in schools, we have introduced a Local Server Solution, a piece of software that allows learners, through a wireless connection, to transfer their game profile data to an educator’s device. The educator’s device is online and in this way, we are able to upload the learners’ game profile data to our servers. Individual player data files are kilobytes in size, so if an educator uses 1MG of data to upload their entire class’ data, it is a lot. We have focused on how to deliver content. Developing content is easy, getting learners to engage with this content is where the challenge lies. If you understand your market, you will know what you need to do to engage with them and have them engage with you and your content. The more active they are on the Kreeate Game, the more they immerse themselves in growing their businesses, managing business administration, such as stock control and paying tax, taking our quizzes to quickly earn batches of the coins, all so that they can progress and climb our leaderboard. We incentivize through prizes such as data, clothing and technology store vouchers and cash. It has been developed on the back of the face-to-face school entrepreneurship initiatives we have been implementing since 2011. We are advocates of entrepreneurship. We have had learners as young as 14 years make in excess of R8 000 for themselves over a period of six months by starting up a micro-enterprise, be it in food, fashion, sport or entertainment. We believe that all learners should be exposed to the practice of making and managing their own money. Some will go on to become entrepreneurs, others will go on to be involved in enterprise. The important thing though, is that they have all been exposed to entrepreneurship. Exposing learners to entrepreneurship should not be the responsibility of the educator because educators are not entrepreneurs. Entrepreneurs, not those in enterprise, should be responsible for advocating and fostering entrepreneurship among learners. People in enterprise have never created something, they have replicated something (like a franchise) or joined a corporation, maybe started and/or run a business unit where they earn a salary. These people have no experience on how to create a business and make money from that creation. These school entrepreneurship initiatives should, like the Kreeate School Entrepreneurship Programme, be extra-curricular. The reason for this? Starting up and running a business is not a five-day-a-week 9-5 activity. It is an “all the time” activity. You are committed to it 24/7, 365 days of the year. Not a day or an hour (even on the golf course) goes by where I am not working on or thinking about my business. Extra-curricular activities teach commitment and discipline, two key factors for any person embarking on the creation of their own new business. Innovation in education, with reference to learning experiences and activities, should also include identifying ways of incorporating regular practical learning experiences on how to create and sustain your own business. Market Day is a waste of time. It should be Market Days, each week during school terms. And involve entrepreneurs in this. There are enough of us out there to speak at schools for one hour per week. Entrepreneurs look to give back, materially and immaterially. One or two hours per week to engage with the future leaders of this country is not a big ask. We have big tasks ahead of us to reduce youth unemployment and improve the standards of basic education. We have the capability. We have resources. At Kreeate Digital, we will play our role as best as we can.